Color plays an important role in human life. It is both a source of joy and a means of expressing a human being's sentiments and feelings. Color delights the heart and yet it can express sadness and gloom. Artifacts found in archeological excavations reveal that human beings have been using color to paint potteries and weapons for over seven millenniums at least, but the main use of color in clothing, i.e. to decorate people's attires, apparently has a far shorter history. Many scholars maintain that use of dyes for coloring clothes began during the Peloponnesian wars between Greece and Sparta, 431 to 404 BC. As usual it was Aristotle to first talk about color and the role it played - and still plays today - in human life. He rightly said that objects seem to have color because of light. Today we know that it is indeed because of light, and specially sunlight, that we observe color. Sunlight consists of seven light waves each of which produces the impression of one distinct color in the human mind as seen through the eye. Objects absorb some of these wavelengths and reflect the others which, combined, create the impression of a certain color as perceived by the human being. (Animals too perceive color though not quite the same way). That sunlight consists of different wavelengths or colors can be easily proved by observing the rainbow, or sunlight passing through a glass wedge. But all this is a very brief and simple account of the physics of light and color. What we are actually concerned with here are colors as seen by human beings, and dyes that produce them and the use of these dyes to produce colored fibers and delightful cloths and clothes. Today, most dyes are produced synthetically from chemicals but although they continuously improve in quality, durability, and stability, generally speaking they cannot match dyes made from natural sources, i.e. plants, soils, and even insects! 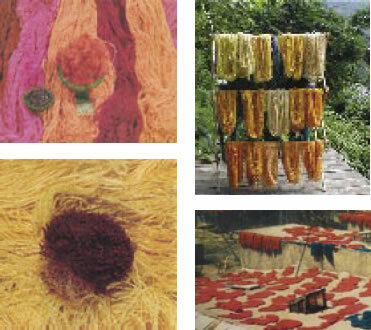 Furthermore, most experts maintain that even if chemical dyes improve rapidly, and in many aspects ultimately even surpass natural dyes, there is still one problem with producing chemical dyes: they require processes and entail operations that give rise to a great deal of pollution and therefore are harmful to the environment; but natural dyes, which are mainly derived from the various parts of plants, mineral materials and living creatures, notably insects, are far less harmful to the environment. In producing dye baths it is of prime importance that the water used in preparing the dye solution be free of any suspended particles or foreign materials. Any foreign material of any kind or size in the water can affect the dyeing process and result in poorly dyed fibers. For example, iron and magnesium cause dye particles to settle down as sediments and therefore result in poor quality dyeing. To remove foreign particles, lime or similar substances can be used to various degrees of success. Most dyes are effective in "light" but some, like rabia-tinctorum, need to be processed in "hard" water. To distinguish light water from hard, all one needs to do is to add a quantity of soap equal to 3% of the quantity of the water, and to shake it well. If the solution remains perfectly clear the water is light but if it turns opaque, like a mixed solution of some water and very little milk, the water is hard. In the dyeing process, first the silk or wool fibers are washed clean, by drenching them in water at 30° to 40° C for two hours. Then the fibers are taken out of the water, and any moisture in the fibers is removed, and the fibers are washed in a mixture of water and a detergent material. These stages are repeated again and again depending on how dirty the fibers are. To prepare dyeing baths, the exact quantity of the main dye material, the liquid (mainly water) in which the solution is made and the temperature and time must be carefully observed so that the dyeing solution effectively penetrates the fibers and dyes them to the exact required color. Time is of absolute importance. Some dye baths do not need to be heated, some others are only effective at high temperatures. The fibers are then placed in the bath and turned round and round for as long as that particular process requires and then the fibers are taken out of the bath and the excess moisture is removed. 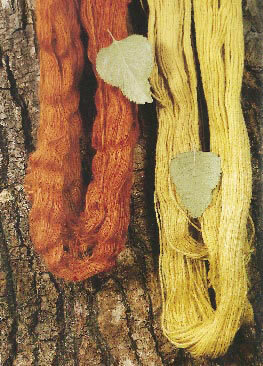 The wool or silk fibers are then properly washed to make sure that the extra unnecessary dyeing matter is washed away. Some dyes can be washed away in ordinary soap water but some require especial detergents. The drying stage is also of great importance. The extra moisture is removed as far as possible and then the fibers are spread in sunlight to dry. 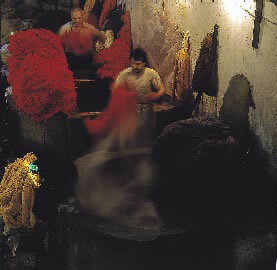 To ensure effective dyeing of the fibers, they must be made to have dandanehs, meaning indentations: the fibers must have a very large number of almost infinitesimal "dents" or "grooves" to absorb the dyes more effectively, the dyeing material thus being able to "grip" and stick to the fibers. With this aim in mind, the fibers are first soaked in water and put aside for some time. The dandaneh bath is then prepared while the fibers soak in water. The water in the bath must be heated and stabilized at a temperature of about 70-80°C. Then the right quantity of the material that produces the dandanehs is added to the water. Then the fibers are placed in the dandaneh bath at 70°C for wool fibers and 80°C for silk. The exact time required depends on the material used. Basically there are two types of dandaneh materials: mineral and vegetable. Mineral dandaneh materials are also of two types: colorless such as aluminum, tin, zinc and nickel salts, and colored such as copper, chromium, and cobalt salts. The most commonly used materials are alums and sulphates or potassium salts, ferrous sulphate, copper sulphate, and sodium and potassium bichromates. 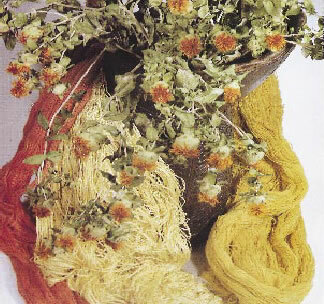 Vegetative or plant materials are usually found in the same plants which give the dye materials. Thus dandaneh materials are used either in parallel to the dyeing process, that is when the material comes with the dye, or before it, as is common with mineral dandaneh materials. Incidentally, these materials can also affect the hue of the dye. The exact nature of fibers varies from one location to another and the final color left on the fiber by the same dye varies accordingly. Also, in spring and summer one can use fresh plants in the preparation of dyes and here again there would be slight differences in tones compared to the color obtained from a dye made of dry plants which give richer colors. Furthermore, dyeing in autumn and winter inside workshops differ in color form those obtained from dyeing in spring and summer outdoors. Needless to say the same plant of the same color gives different shades from one village to another. In some parts of Iran the people are too poor to procure dyeing plants from other areas and these are not available locally. Therefore, fibers of natural color are used: the color of the wool sheared from the sheep, white, cream, brown and gray. Reseda luteola: This is one of the best dye raw materials and when properly processed gives a delightful yellow. It has been known and used for over five thousand years. It's a wild plant that grows once a year and belongs to Central Asian and Mediterranean regions and climates. In spring and autumn it blossoms giving yellowish-white to yellow flowers. Escoti: This plant blossoms in autumn and winter and gives white flowers. The blossoms are boiled in water to give a greenish yellow color dye which is used with its own particular dandaneh material (white alum and salt). Punica-granat: This is derived from the peel of a fruit, indigenous to Iran. It comes from a tree with spiky branches that gives red flowers and a round fruit with a tough skin or peel which contains tannin and therefore does not need dandaneh producing additives. It gives dyes of gray to black as well as red, reddish-brown, green to olive-green colors. Sapanwood: This is a tree with spiky branches indigenous to the Americas, which found its way to the other parts of the world through the Spanish expeditions. The dye is obtained from the thick liquid that lies beneath the bark. It is boiled and combined with sulphuric acid to give a red dye and with caustic soda to produce a violet dye. Raspberry: Raspberries are edible fruits like most other berries that grow in humid regions in most parts of the world. Raspberries are to produce red colored wool and silk fibers. Allium cepa: This is a yearly plant with a bulbous root. It grows 60 to 100 cm tall. The bulb is covered in a thin skin which can give copper, orange and even pink colors. Quercus persica: The shell of the fruit of this plant, which is indigenous to western parts of Iran, gives the dye known by the same name. It begins to flower from the age of four years. The shell of the fruit of this tree, the acorn, has two skins, the outer of which is a hard shell that gives a reddish substance. The inner skin is soft and gives a brownish substance. With different processes, in combination with other materials, it gives, dark red, brown, cream, gold and orange colors. Rubia-tinctorum: This is one of the oldest substances used in the production of red dyes. It grows in most parts of Iran. It has been recorded in history that Arab merchants took this substance and introduced it to Europe through Spain. The plant is a shrub with plenty of branches and leaves, 50 to 100 cm tall. It gives the best dye at the age of two years. The dyes derived from this plant are red, violet, and dark orange. Crocus sativus: The ordinary saffron, a bulbous plant that grows in Khorrasan and Isfahan Provinces of Iran, as well as in Spain and to a much smaller scale in many other parts of the world. It dissolves well in alcohol and gives yellow, and gold-yellow as well as red dyes. Rhus coriaria: In Iran this plant is mostly used as a food additive and is called somaq. It gives light to dark brown dyes. All parts of this plant can be used to produce dyes. Kermes/cochineal: For thousands of years human beings have used this insect to produce dyes. It lives mainly on the leaves and branches of the oak and fig trees and lives on the gums of the trees. It lays eggs that have a severely unpleasant odour. A wide range of dyes are produced using this insect as the raw material, including a wide range of red, cream, and orange. Indigofera-tinctoria: It's a bush/tree that can be as tall as 1.5 m with red leaves, and bunches or clusters of little pink and violet blossoms. Juglens-regia: This is a beautiful tree and the dye material is in the outer peel or skin of the fruit. It is abundant in the north of Iran as well as all other milder regions of the country. The skin contains a large quantity of tannin and therefore needs no additives for creating the dandanehs. It gives dyes of brown, dark brown, gray and black colors. It has extensive use in dyeing fibers used in carpet weaving. Combretaceae: The substance is found in the two forms of yellow and black. It is derived from a plant by the same name that grows in many parts of the world. The plant gives small tomato-like fruits that are picked before they ripen. The fruits are then dried and ground. In case of the black type the leaves are also used in the processing. The yellow type gives dyes of yellow color if processed together with an adequate quantity of tannin, enough to act as dandaneh producing ingredient. The black variety results in red, brown, and even green and black dyes. Other important dye raw materials worth mentioning here are: glycyrhiza glabra, nuphar lutea, morus alba, carthamus tinctorius, and dryopteris filx, berberis vulgaris.